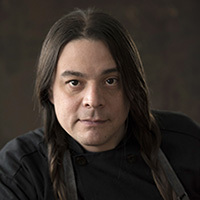 Chef Sean Sherman, Oglala Lakota, born in Pine Ridge, SD, has been cooking across the US and Mexico over the past 30 years, and has become renowned nationally and internationally in the culinary movement of indigenous foods. His main focus has been on the revitalization and evolution of indigenous foods systems throughout North America. Chef Sean has studied on his own extensively to determine the foundations of these food systems to gain a full understanding of bringing back a sense of Native American cuisine to today’s world. In 2014, he opened the business titled, The Sioux Chef as a caterer and food educator in the Minneapolis/Saint Paul area. He and his business partner Dana Thompson also designed and opened the Tatanka Truck, which featured pre-contact foods of the Dakota and Minnesota territories. In October 2017, Sean was able to perform the first decolonized dinner at the James Beard House in Manhattan along with his team. His first book, The Sioux Chef’s Indigenous Kitchen was awarded the James Beard medal for Best American Cookbook for 2018 and was chosen one of the top ten cookbooks of 2017 by the LA Times, San Francisco Chronicle as well as the Smithsonian Magazine. This year, Chef Sean was selected as a Bush Fellow. The Sioux Chef team of twelve people continues with their mission to help educate and make indigenous foods more accessible to as many communities as possible through their recently founded non-profit entitled NATIFS.